Summary: Toshiba packed quite a bit of highlights into the Satellite S55t. 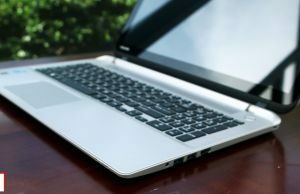 You get an unique looking machine, Broadwell hardware, a decent trackpad and a very nice FHD touchscreen. It lacks in the typing department though and whoever plans on buying this notebook should take good care of it, since the build is rather fragile. 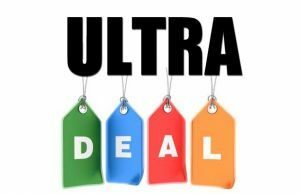 Back to school sales have begun and there’s now a deeper batch of affordable Broadwell ultrabooks to choose from. 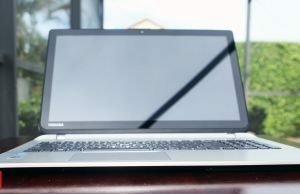 I was excited to see the Toshiba Satellite S55t go on sale last week so I decided to pick one up. I figured this model would be a common choice for students because of the modern look, nice screen and the sound system they tout. The price I paid was also pretty low and seemed too good to be true. Is it worth it, or did Toshiba skimp on some of the internals? Read on to see what I think about it after a few days. This model of the Satellite stands out to me, but I’m not sure if it’s a good thing or not. 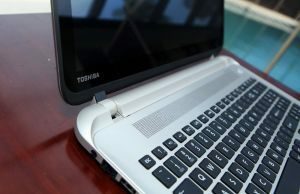 Toshiba touts an “aerodynamic” look, and it is indeed quite different looking than most of the competition. It’s not the thinnest ultrabook, but from the top and sides, it looks great. 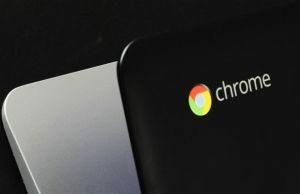 The lid and palmrest are are made of aluminum, but there are still some parts made out of plastic, such as the underside and the edges. The footprint on the back side is more rounded than the front, which gives it an attractive and unique look. The color is listed as satin gold, so I was expecting something along the lines of the UX303 in color. To my surprise, it seems more like silver though, which is fine by me. 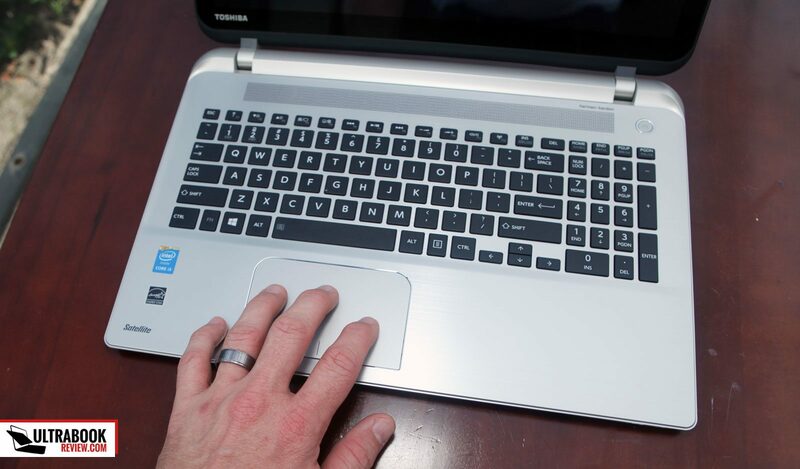 On the lid, it’s your typical brushed aluminum style, with the Toshiba logo located incognito, in the lower corner. There’s a thin plastic band on the top edge, probably to reduce Wi-fi interference. It’s not too bad looking and feels like it will hold up over time. The lid is pretty thin as far as touchscreens go. Most of the edges are pretty well rounded and feel like it was put together pretty well. Unfortunately lifting the lid isn’t a one finger job. They were sooo close, but you need a second finger pushing down to get it past the opening threshold. It’s amazing how these laptop manufacturers still can’t get this feature right. The screen angle can be adjusted pretty well for the most part, and it extends back to a reasonable angle. 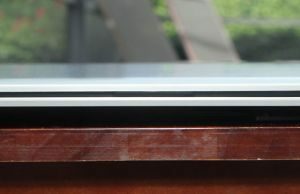 Being a 15” touchscreen and as thin as it is, the screen does tend to wobble when using it for touch. It’s not the worst I’ve witness, but I’ve certainly seen better, particularly in the Asus Q500 series. The keyboard area is where things start to look a little unorthodox. 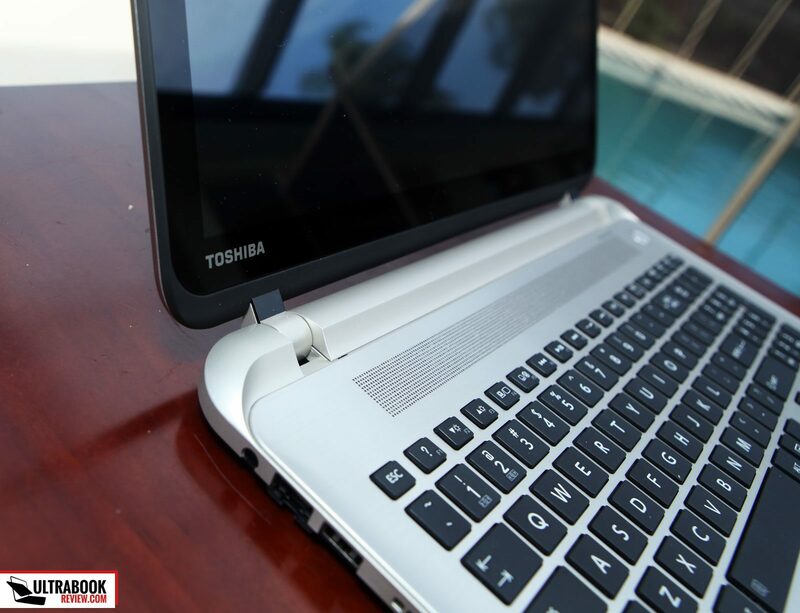 The hinge area is a raised portion which mates with the bottom part of the screen. I guess it looks OK, but it certainly is different and I got a couple comments on it – both good and bad. I worry over time that it might turn into a dust/debris trap which, being plastic, will certainly get scratched up pretty easy. Underneath that, is a long speaker grill with the power button distinctively placed on the right hand side. 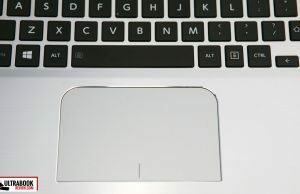 The keyboard is slightly recessed than the rest of the palmrest, keeping the keys away from the glass while closed. 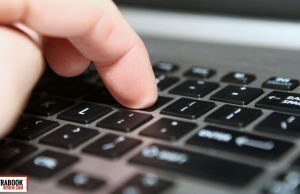 Finally, the trackpad is located right below the spacebar. As I said before, the edges are made of plastic. I’m really not sure why they chose that route over having the edges being the same piece as the palm rest, but I assume cost is the reason. Either way, it’s unfortunate because the palm rest actually rests inside the plastic frame. This will undoubtedly become a dust and dirt trap. This frame is also part of the same piece as the raised back portion underneath the screen. So as far as the edges go, there are stepped 90° angles on both the sides and the front of the palm rest. Luckily the metal edge is slightly rounded, but the second plastic edge is a little sharp. Long typing sessions may be uncomfortable if you rest your wrists on the edges like I do. 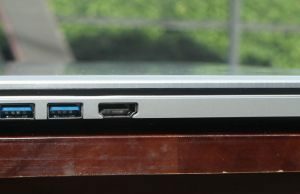 Connectivity around the sides is pretty good for an Ultrabook. On the left, you have your power adapter, Ethernet and a single USB 2.0 port. There’s also the CPU exhaust coming from that direction. On the right hand side is a security lock, HDMI, 2x USB 3.0 ports and a combo headphone/microphone jack. The most ingenious feature is the memory card slot on the front. I thought it was a bizarre spot until I put the card in and realized how flush it rested with the front edge. You can literally put the card in and leave it there forever, if you wished, and you would never notice it. Now if only other companies would follow suit with this feature and maybe even add an USB port for a nano-USB dongle (for a mouse). The underside is nothing special at all. If anything, it’s their biggest mistake in the design. It’s really thin! Normally that wouldn’t be such a bad thing but they cut out so many passive vents in the middle section, it makes plastic really flexible. So when picking it up from the sides and the right side, I could actually feel my index finger flexing the plastic on the vent area. I’m sure people will get used to this, but I found myself being extra cautious in the few days I used it. Over time, I really feel like I would accidentally punch a hole in it or something. Maybe I’m overreacting but I don’t recall having a bottom cover be this flimsy before. Unfortunately I didn’t take the back cover off for this model since I read other reports of the plastic clips being so delicate and didn’t want to ruin it for the next guy. 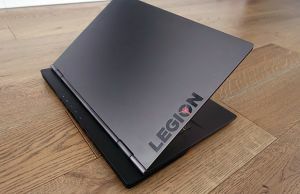 I did see pictures of the insides though and there is a replaceable 2.5″ HDD inside, along with a spare open RAM slot. 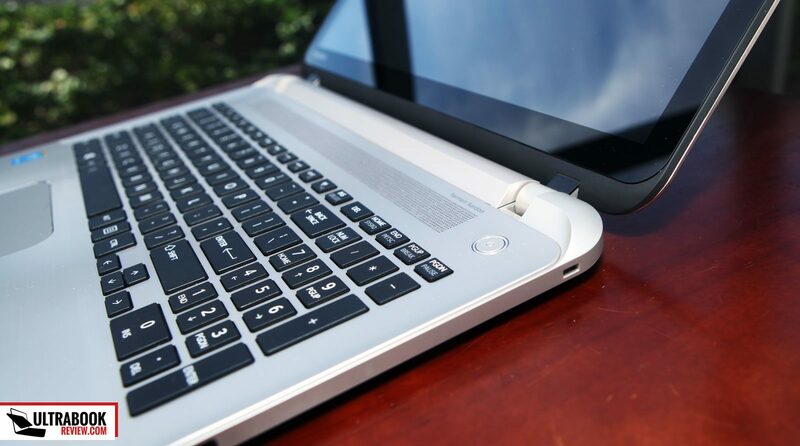 Another unique feature with this laptop is the removable battery. Instead of the typical locking switches you would normally see, Toshiba opted for screws. So removing the two screws below the battery will allow for ease of replacement. The keyboard is not the greatest experience. 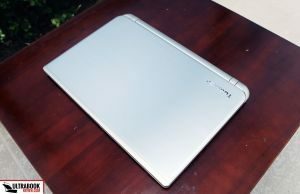 The keys feel extremely cheap, comparable to the keys found on last year’s Asus Vivobooks and their ultra cheap T100 convertible. The key travel was below average and the feedback made the keys feel very mushy. Needless to say, typing fast was a difficult task. 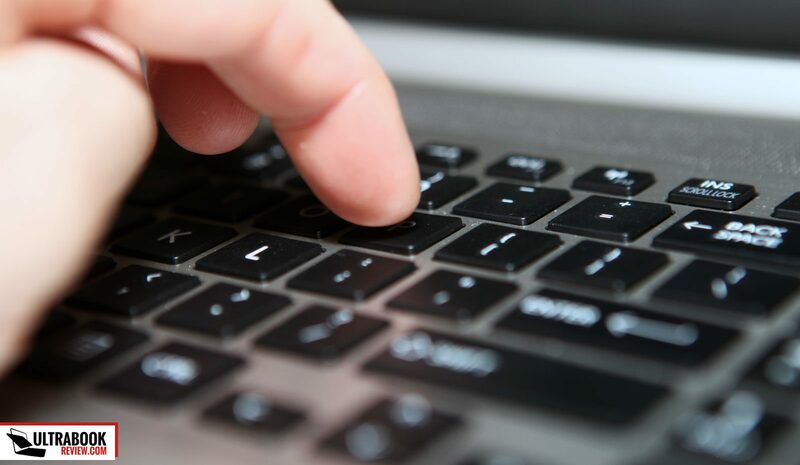 If you’re not touch typist, it will do, but there are better options out there. The keys have decal lettering on them, which may fade over time (only time will tell for sure). Unfortunately the keyboard isn’t backlit either, so the keys will be more difficult to read at night. The key layout is pretty good, and the keys are properly sized, with the exception of the arrow keys being half height. The F keys are along the top and are integrated with the media controls. By default, the media controls come first, so you’ll need to hit the FN key to access the F key functionality. I couldn’t find a way to switch this feature unfortunately. More bad news on the F keys is the small text and poor color choice of dark grey. Don’t expect to see which ones are which in a dark room – it’s almost impossible. 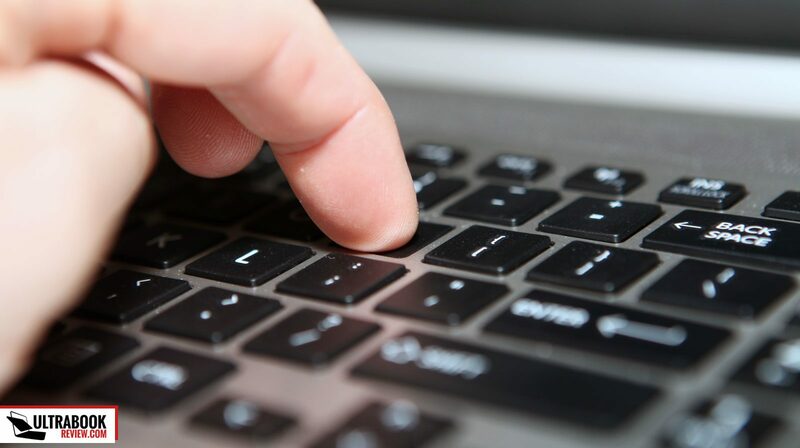 The trackpad on this machine is a little unique, when it comes to looks. The top edges are more rounded, perfectly matching the overall footprint of the laptop. The edges are chamfered and are given a chrome finish, for added effect. 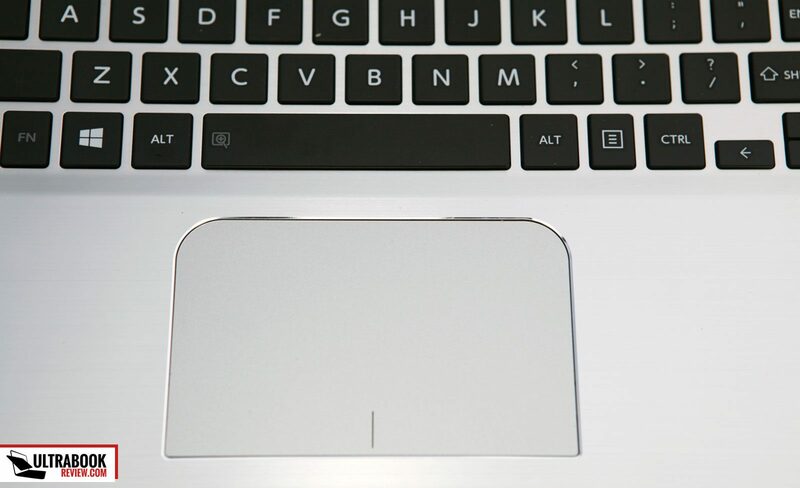 The trackpad is a clickpad, with integrated left and right buttons on the lower edge. It’s certainly big enough for most tasks and I grew accustomed to its size and placement quite easily. 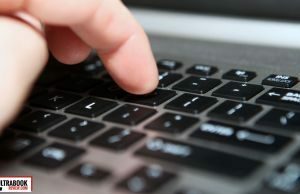 As far as the trackpad performance is concerned, this one is pretty average if you ask me. It tracked well and taps and gestures actuated properly, for the most part. The surface texture feels a little rough and cheap though, which diminishes the experience. 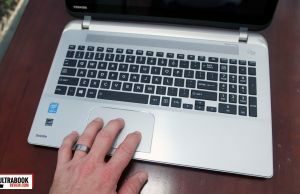 It’s an Elan trackpad, so you’re able to customize your gestures and settings to some extent. I didn’t have any issues with jumpiness or anything. This model is equipped with a 1920 x 1080 pixel resolution 15-inch IPS touchscreen and it’s absolutely the highlight of the machine. The viewing angles and color accuracy are really good, the image is sharp and the brightness is just right. 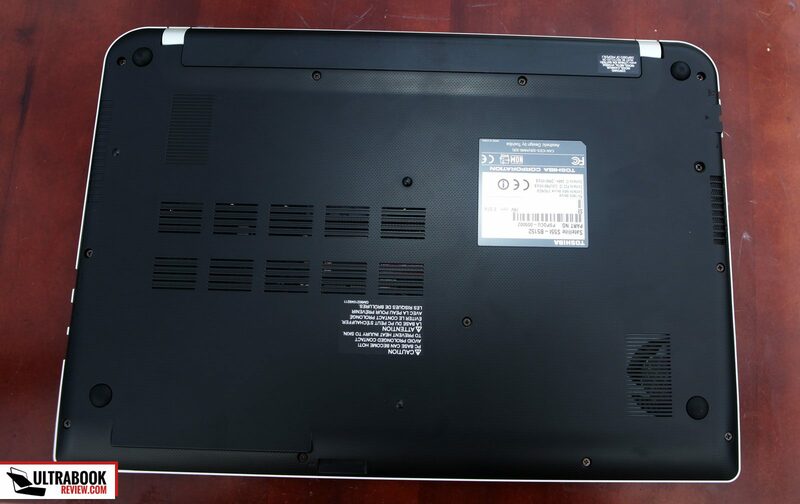 The panel is made by LG, with the model LGD0470 LP156WF6-SPA1, if you want to look up the specs. 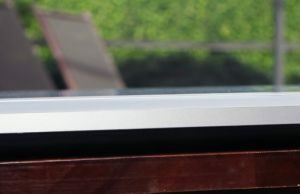 It’s a touchscreen, so there is a glare prone glass panel on top of the LCD, so you might have a difficult time with reflections outdoors. The maximum brightness is only average, so don’t count on that to overpower the sun. As far as the touchscreen goes, the panel is pretty much edge to edge glass. Touches are both responsive and accurate and multi-touch gestures worked fine for me. 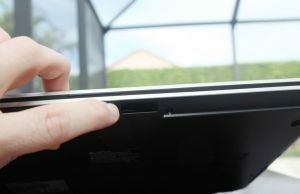 As with most 15″ touchscreens, the panel wobbles a little with touches due to the hinges not being strong enough. It wasn’t so bad that I disliked the experience, but it’s certainly worth noting. 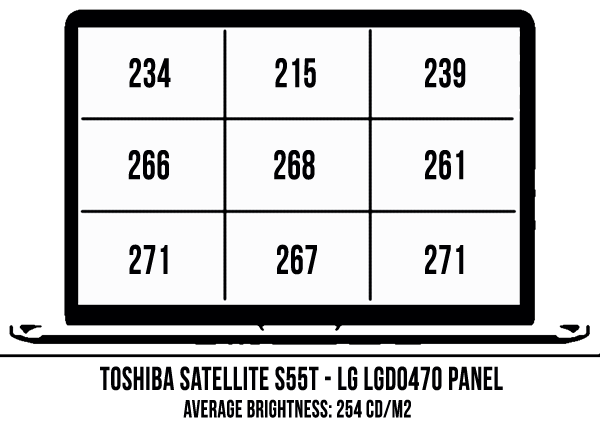 Color accuracy on this panel is very good, with readings of 91% sRGB, 68% NTSC and 71% aRGB. It’s not the best screen for accurate photo editing, but it’s good enough and will work as a low cost option, if you really need it. The contrast ratio was measured to be roughly 600:1, which is good. 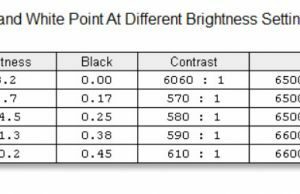 At full brightness, blacks measured at .45 nits and whites at 270 nits. White point measured to be 6600K. For details on more brightness settings, please see the chart. Below is a chart showing the brightness distribution of the screen. 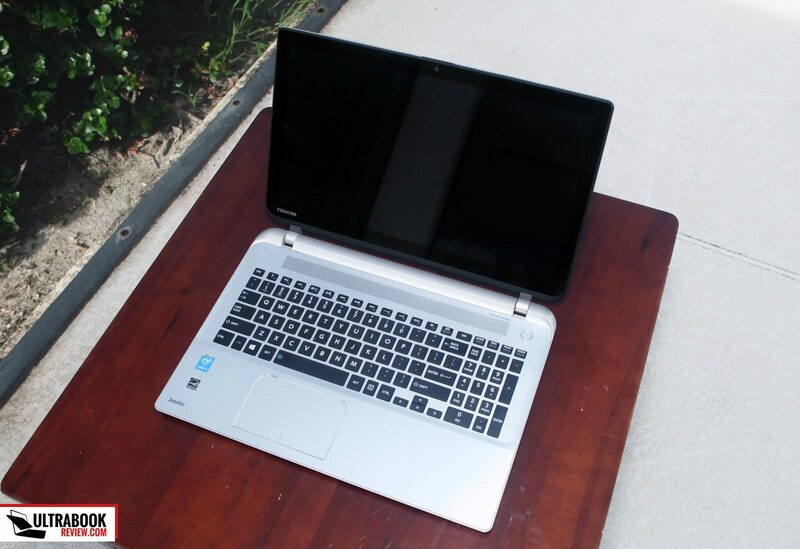 Powered by an i5-5200U Broadwell CPU, this laptop handled everything from Office to Photoshop pretty well. The spinning hard drive is definitely the bottleneck and should be replaced with a SSD if you want to use this machine to its full capabilities. Other than that, I was able to surf the web, edit some pictures and multitask pretty well. The RAM might be a limitation to some of you, so if you’re opting to upgrade your HDD to a SSD, you might want to pick up an extra 4GB chip of RAM as well. Below are some of the benchmarks I ran. As expected, it performed slightly better than the i3 models we’ve been seeing and about on par with the other i5 Broadwell models. CineBench R15: OpenGL 22.15 fps, CPU 260 pts, CPU Single Core 106 pts. x264 Benchmark 4.0: Pass 1 – 84.52 fps, Pass 2 – 16.17 fps. 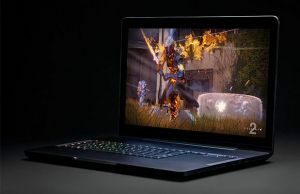 Overall, you shouldn’t be playing games with integrated graphics unless you’re willing to sacrifice both resolution and graphic details. You certainly won’t be able to play any more modern games. There is a single fan on the left hand side that has an intake on the bottom and exhausts on the left edge. The fan itself is pretty quiet for the most part. I hardly noticed it unless I was playing a game, and even then, it wasn’t that bad. I measured the sound at head level and got a reading of 24dB, with ambient noise in the room measuring 15dB. As for heat, the maximum CPU temperature I measured was 77C when pushing it with a game. The fan managed to keep temperatures equalized without having any noticeable throttling. Surface temperatures on the laptop were also measured, both during normal tasks and while under load playing a game. Here were my results. WiFi performance is pretty decent with the onboard wireless AC card. At approximately 30 feet from my router, I was getting download speeds of 57.6Mbps. The entire time I used the machine, I never had and drops or glitchy signals. 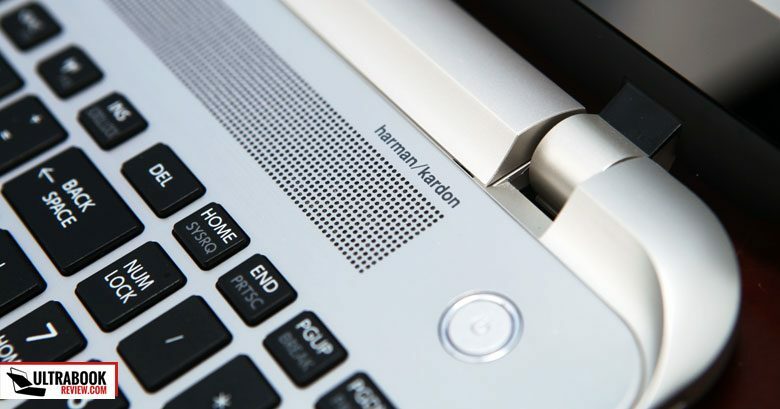 The Harman/Kardon speakers are another positive highlight of the laptop. They reside underneath the grill above the keyboard and are upward facing. At full volume, I measured 85 decibels when playing a song at full volume off Youtube. For reference, my ambient noise in the room was 15dB. All the sounds were very clear since the speakers were actually facing towards me and weren’t muffled from my lap. This is a welcome change to the downward facing speakers so many laptops have. The bass was also pretty decent, but nothing to write home about. I’ll give Toshiba an above average grade on their sound choice though – they got it right. My battery test consists of using the stock “Power Saver” power profile, 20% brightness(70 nits), WiFi off, Bluetooth off, and running a 720p movie in a continuous loop at full screen with the volume muted. I start the clock when it’s unplugged and stop it when the unit performs a self- shutdown. 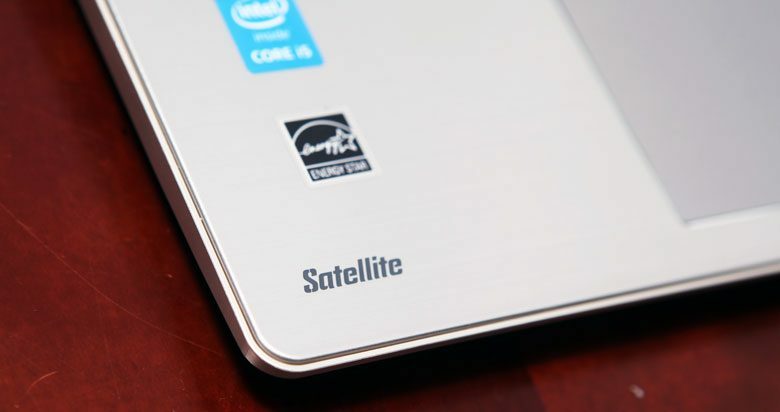 The Satellite S55t lasted 6 hours and 31 minutes before shutting down. I’d say that’s pretty decent, considering the nice screen and the size of the battery they chose. The bios has a few features worth noting. First, it’s touch enabled, so no need for the keyboard, not that it should be an issue. In Power Management, you have the option to wake on LAN, keyboard or critical battery. You can also set the laptop to power on when opening the lid, which is off by default. There is also a battery saver mode for the SATA drive, which I never tested but will undoubtedly lower performance to increase battery life. Everything else is pretty typical for what you’d expect to see in a laptop. The power adapter is about as small and light as they get. I’ve been seeing these same bricks more often lately, with the same specs but different branding. 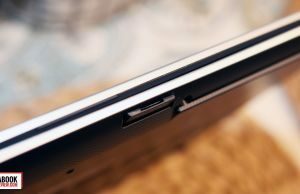 The HP Spectre power brick, for example, looks identical. 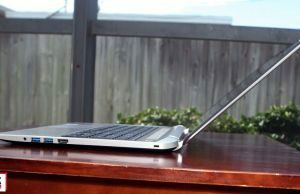 The connection to the laptop is properly sized, but the 90° angle might get in the way of your Ethernet connection, so you might be flipping it around sometimes. 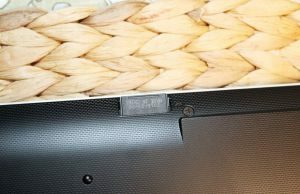 The model in this review can be purchased at a few online retailers and all their prices have seemed to drop drastically over the past few weeks. Amazon currently has them on sale for roughly $450, which is an appropriate price, in my opinion. Follow this link for up-to-date prices at the time you’re reading this post. 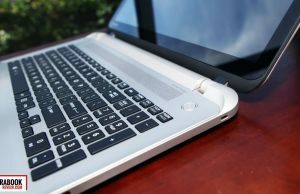 When it comes to buying a laptop, I tend to rely on a couple features the most: the keyboard and the screen. They are the parts you look at and touch every day and there’s no substitute for them without using external sources. This machine excels with the screen, but lacks in the typing department. If it wasn’t for the keyboard, I would probably recommend it to everyone, but that really is its fatal flaw. If you can live with it though, Toshiba has managed to pack quite a bit of highlights into this package. 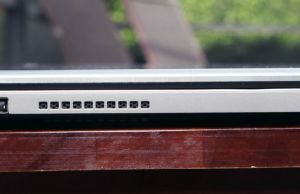 You get an unique looking machine, if you’re into that, with a Broadwell i5, a decent trackpad and a very nice FHD touchscreen. 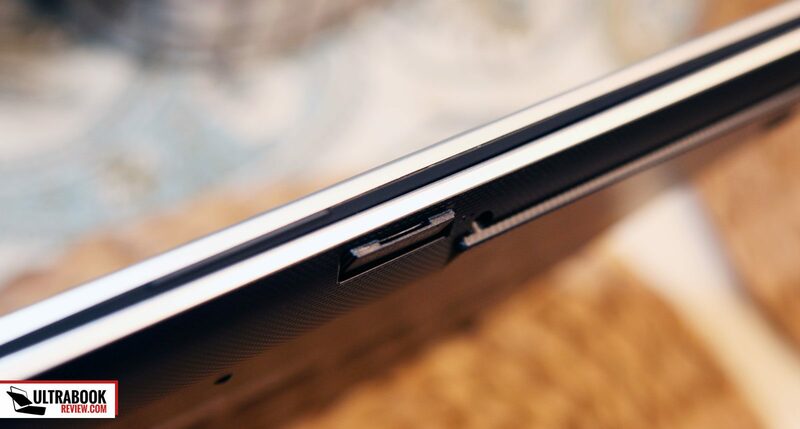 And let’s not forget that cleverly placed memory card slot. 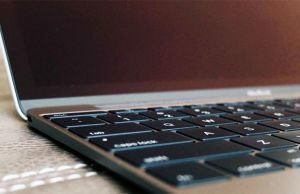 Pop in an SSD and 4 more GB or Ram and you’ll have a pretty efficient machine that can do some semi-heavy work – including professional photo editing. The ideal buyer for this laptop is going to be someone who does a lot of Internet surfing, media consumption and even graphic arts work. If you type a lot and type well, this isn’t for you. But if you’re not a typist and you mostly type in the light, I think you could squeeze this one by, based on the price. One thing is for sure, whoever plans on buying this should be the type of person that takes care of their laptop. The flimsy bottom, scratch prone aluminum lid and the dust traps are going to look real ugly, fast, if you don’t treat it well. My two cents. If you liked my review or have any questions, please leave a comment below. I’d be happy to help in any way I can. Thank you so much for your review. May I ask you a question? Why if this screen is IPS, it is not mentioned on toshiba site? I even called them and they say it’s not IPS. 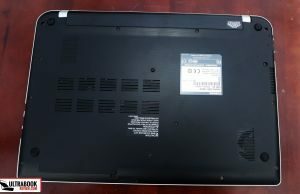 I was about to buy this laptop from MS site, but was not sure about the screen. The data sheet for the model of screen I listed in the review only says TFT LCD. That’s a very vague spec since a-Si TFT can mean either TN or IPS. I put IPS in the review because it looks like IPS to me, the color gamut measurements support IPS/PLS standards and I saw the panel for sale somewhere and they claimed it was IPS. It very well might be a different form of panel but it definitely wasn’t TN. If it was TN, it was by far the best TN panel on the planet because the color accuracy and viewing angles were really good. Again thank you so much for that quick reply! Your help is so much appreciated. I kinda become obsessed with this, lol. I googled it and found this: http://www.panelook.com/LP156WF6-SPA1_LG%20Display_15.6_LCM_overview_24181.html where it says it’s AH-IPS. How did you find Panel number? Ah yes, there it is. I thought I saw it somewhere official but wasn’t positive. HWinfo gives you most, if not all of the model numbers of the components. So I ordered the laptop and got it yesterday. The panel indeed is LP156WF6-SPA1 and while looking at it at different angles it looks like IPS. I have no idea why Toshiba’s hiding this fact. It is IPS. You can use this test to determine the type of panel you have if it isn’t stated.